Info "Spin the nut to release the bolt! Spin Spin Spin!" Nuts and Bolts is one of WarioWatch's microgames in WarioWare: Twisted! The game's purpose is to spin a nut and release its bolt. To do so, the player has to use the Game Boy Advance's tilting ability. If they manage to release the bolt, the game is won. 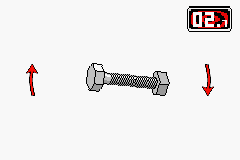 1st level difficulty: The bolt is close to the nut's buttom. 2nd level difficulty: The bolt is in the middle of the nut. 3rd level difficulty: The bolt is close to the nut's top. This page was last edited on November 16, 2018, at 22:10.